, a modern philosopher, was born at Naples in 1508, and received the first part of his education at Milan, where he acquired a perfect knowledge of the Latin and Greek languages. After passing two years at Rome, where he made great proficiency in polite learning, he removed to Padua, and applied with indefatigable assiduity to the study of mathematics and philosophy. He very judiciously employed mathematical learning in explaining and establishing the laws of physics, and was particularly successful in investigating truths before unknown in the doctrine of optics. 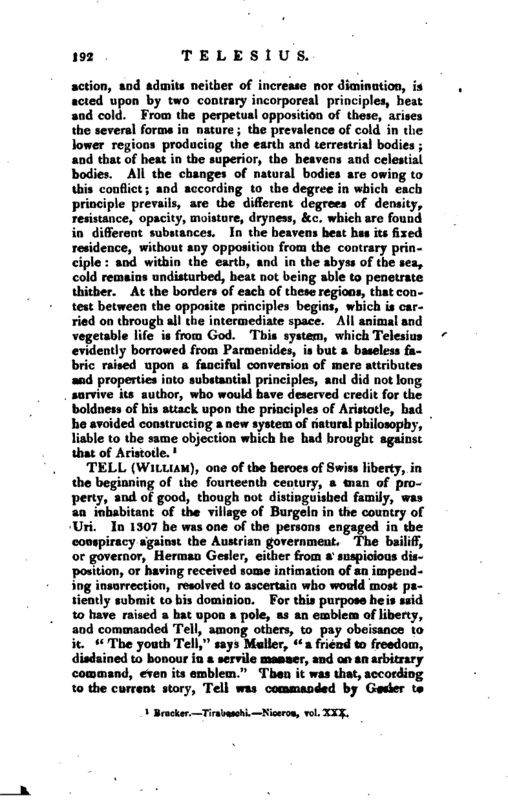 Accustomed to mathematical accuracy, he grew dissatisfied with the conjectural explanation of natural appearances given by Aristotle, and expressed great surprise that this philosopher should have been, for so many ages, followed in his numerous errors | by so many learned men, by whole nations, and almost by the whole human race. He pursued his researches with great ingenuity as well as freedom, and wrote two books “On Nature,” in which he attempted to overturn the physical doctrine of the Peripatetic school, and to explain the phenomena of the material world upon new principles. 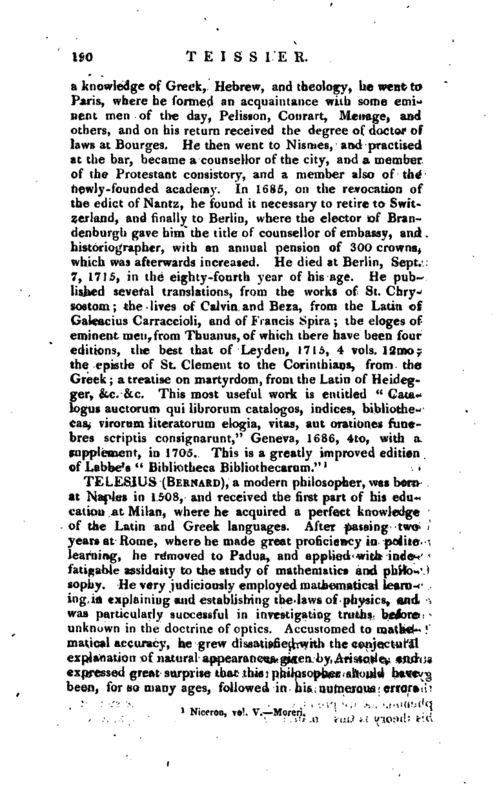 When this treatise was first published at Rome, it obtained great and unexpected applause, and Telesius was prevailed upon by the importunity of his friends at Naples, to open a school of philosophy in that city. 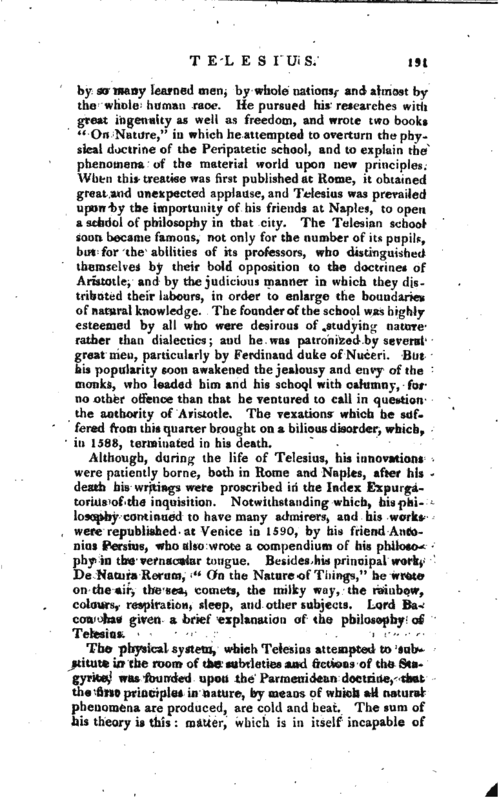 The Telesian school soon became famous, not only for the number of its pupils, but for the abilities of its professors, who distinguished themselves by their bold opposition to the doctrines of Aristotle, and by the judicious manner in which they distributed their labours, in order to enlarge the boundaries of natural knowledge. The founder of the school was highly esteemed by all who were desirous of studying nature rather than dialectics; and he was patronized by several great men, particularly by Ferdinand duke of Nuceri. But his popularity soon awakened the jealousy and envy of the monks, who loaded him and his school with calumny, for no other offence than that he ventured to call in question the authority of Aristotle. The vexations which he suffered from this quarter brought on a bilious disorder, which, in 1588, terminated in his death. Although, during the life of Telesius, his innovations were patiently borne, both in Rome and Naples, after his death his writings were proscribed in the Index Expurgatorius of the inquisition. Notwithstanding which, his philosophy continued to have many admirers, and his works were republished at Venice in 1590, by his friend Antonius Persius, who also wrote a compendium of his philosophy in the vernacular tongue. Besides his principal work, De Natura Rerum, “On the Nature of Things,” he wrote on the air, the sea, comets, the milky way, the rainbow, colours, respiration, sleep, and other subjects. Lord Bacon has given a brief explanation of the philosophy of Telesius.